Overstock (OSTK) shares spiked a ridiculous 310% between the end of July and their peak on Monday. It's an unbelievable move that even bested bitcoin's spike during that period. Not bad for a stock that had been down on the year before that point. 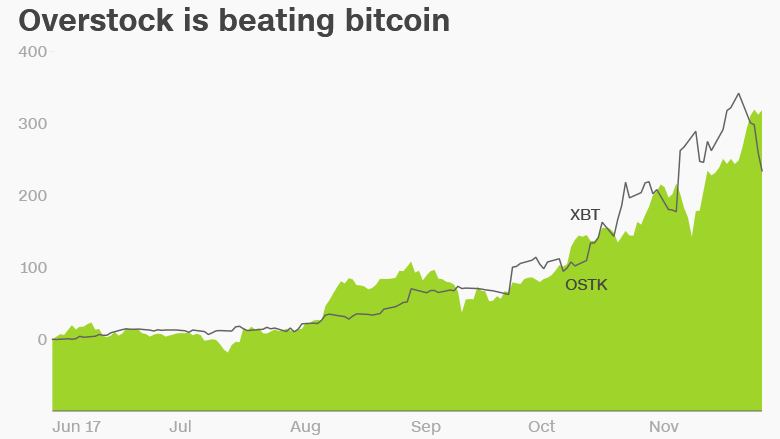 But much like bitcoin itself, Overstock is vulnerable to sudden nosedives. The stock has collapsed 20% over the past two days, echoing bitcoin's retreat. Overstock didn't make any announcements that would explain its drop this week. "Bitcoin's a wild ride. If you've hitched your cart to that horse, you're going on a wild ride yourself," said Nicholas Colas, co-founder of DataTrek Research. Related: Bitcoin at $11,000: What the heck is going on? Square, the popular mobile payments service run by Twitter (TWTR) boss Jack Dorsey, is also getting in on the bitcoin boom. Square (SQ) was already having a terrific year when it announced on November 15 an experiment to allow some users of its Cash app to purchase bitcoin. "We're always listening to our customers and we've found that they are interested in using the Cash app to buy bitcoin," a spokesperson for Square said in an email to CNNMoney. News that Square is dabbling in bitcoin sparked a frenzy that lifted the company's stock by 24% in the span of 10 calendar days. The bitcoin pop proved fleeting for Square though. The stock plummeted 16% on Monday after financial services firm BTIG downgraded it to "sell." Square retreated again in recent days as bitcoin dipped. BTIG analyst Mark Palmer acknowledged that Square has suddenly become viewed as a "play on a trendy cryptocurrency." It's "not optimal from a risk standpoint" for Square to have "its fortunes tied to those of a cryptocurrency that has frequently displayed extreme volatility," Palmer wrote. Besides, Palmer said that even if Square's bitcoin experiment succeeds and it can start charging a fee for trades, the cryptocurrency would only provide a "marginal" boost to the company's revenue. Here's another bitcoin mover: Riot Blockchain (RIOT). This very tiny company -- a market value of just $110 million makes it subject to violent swings -- has spiked 245% so far this year. It's nearly doubled this month alone. Riot calls itself a "first mover" in blockchain, which is the technology that bitcoin is built on. Blockchain is a public ledger containing the transaction data from anyone who uses bitcoin. It's clear the enormous potential of bitcoin has captured the imagination of investors looking for the next big thing. 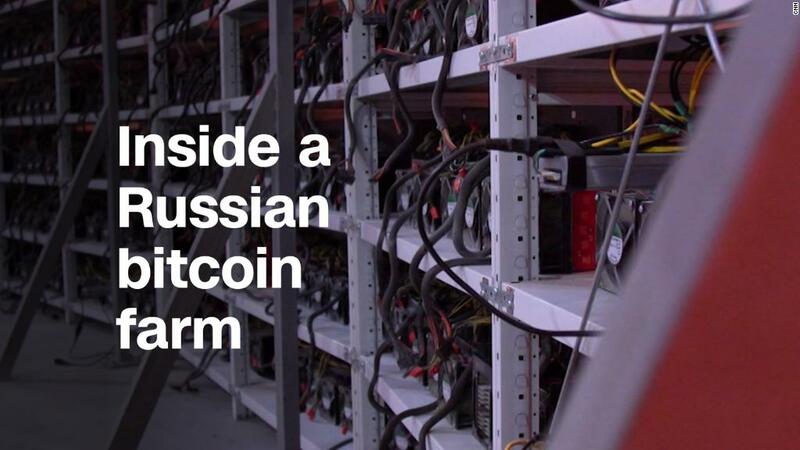 The cryptocurrency has even received support from some established players. For instance, Nasdaq (NDAQ) confirmed to CNNMoney that it plans to launch bitcoin futures next year. That follows plans by CME Group (CME), the owner of the Chicago Mercantile Exchange, to start listing bitcoin futures, which allows investors to buy and sell an asset (often commodities like oil or gold) at a specified price at a later date. And bitcoin has its fair share of believers, including Goldman Sachs (GS) CEO Lloyd Blankfein and PayPal (PYPL) co-founder Peter Thiel. Bespoke Investment Group wrote in a recent report that while "we don't know when the bitcoin craziness will end," the bitcoin-related stock swings "echo" back to the way that internet stocks moved at the end of the dotcom bubble. "If a stock like Campbell Soup decided to announce that it was putting all of its soup containers on the blockchain," Bespoke wrote, "it would probably double or maybe even triple!"